A 20-year old former McKinleyville High School Panther has died from injuries sustained in a traffic accident east of Titlow Hill Road. 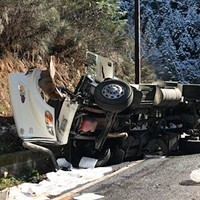 Ramiro Melecio, who also studied at College of the Redwoods, was driving east on State Route 299 yesterday afternoon when he failed to negotiate a left-hand turn, left the roadway and collided with two trees. He was transported to St. Joseph Hospital with major injuries and passed away this morning. According to the California Highway Patrol, Melecio's death is the 11th road death in 2016. Update: The Humboldt Area office is saddened to inform you the young 20 year old; Ramiro Melecio had succumbed to his injuries sustained in the traffic collision. Our thoughts and hearts go out to the family, friends and the community. 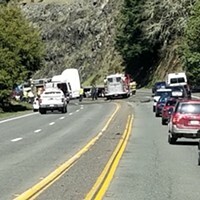 Willow Creek, Calif. – On the afternoon of Monday, November 21, the driver of a Saab drove off SR-299 and sustained major injuries. At approximately 3:00 p.m., 20 year old Ramiro Melecio of McKinleyville was driving a 1999 Saab 4door sedan eastbound on SR-299, east of Titlow Hill Road at an unknown speed. For reasons still under investigation Melecio failed to negotiate a left hand turn. Melecio’s vehicle veered off the roadway where the Saab collided into two trees. Melecio suffered major injuries as a result of the collision and was ultimately transported to St. Joseph Hospital for medical treatment. DUI is not believed to be a contributing factor in this collision.